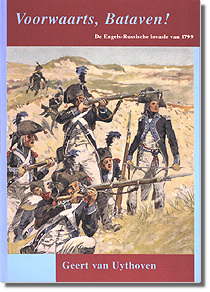 Napoleon Series Reviews: Voorwaarts Bataven! Readers of the Napoleon Series forums and articles section will recognize Geert as the expert on all matters Dutch. Readers of First Empire magazine will also know him from his series of articles on the 1799 affair. Now, finally, he has managed to get it all into his first full-length book. In July 1799 the British and Russian governments decided on a joint effort to "liberate" the Netherlands and to form a strong buffer state under the house of Orange, comprising the Batavian Republic and the Belgian departments. The French invasion of Ireland had been a failure, liberating British troops to act elsewhere. The French armies were engaged on a number of fronts and could not spare a large force to oppose a landing, while the Dutch armed forces were not to be feared. The populations of Belgium and Luxembourg had risen against the French in the autumn of 1798 in the Boerenkrijg and the Knüppelkrieg, so no doubt the Dutch population would do the same. It would be a walkover! But the reality turned out to be very different. Not only did the French manage to assemble a force, but the Dutch population did not rise and the Batavian army turned out to be a fighting force to be reckoned with after all. After some initial successes in late August, not in the least the capturing the Dutch fleet (a fleet Napoleon would later miss so sorely in his plans for the invasion of England), the Anglo-Russian forces were severely beaten on 6 Oct. Forced into the swamps of de Zijpe the campaign was effectively at an end. To my knowledge there is no modern account of this campaign before Geert published his book, and that is surprising as this was such an interesting campaign. Students of military history will find this a fascinating read. The 1799 campaign in Holland was a tactical nightmare. This is a campaign that was totally dominated by terrain. It is a story of beaches and three-hundred-foot-high dunes. Of dikes, canals and ditches. Of victorious troops being forced to surrender because routed enemy formations have rallied and cut off the only way out without even knowing it. Of useless cavalry, and artillery that has to be manhandled on narrow dikes, only to find its field of fire obstructed by friendly troops. It is also one of the very few campaigns where naval artillery support of land forces could make a difference. This was not a campaign of grandiose tactical designs, but of hard fighting by determined troops, storming bridges with the bayonet, and generals leading from the front. It is of course also a story of routs and commanders-in-chief on all sides being completely unable to cope with the situation. Fans of Vandamme, Durutte, Daendels and Dumonceau will be pleased, and those who believed that the Dutch commanders at Waterloo did not know their job, will have to think again, for they will recognize a host of familiar names doing rather well against Russian grenadiers and British Guards. Telling a story like this, where the chronology of events is crucial and the action is very confused, is not an easy task. But the author has done a great job. Geert's style is very clear and concise and he always sticks to the story line. Admirers of "Marbot-like" anecdotes might not be pleased. On the other hand, those who like a neutral and objective account of the facts and nothing but the facts, down to company and platoon level, will find the book very much to their liking. To be able to write a book this requires not only a detailed knowledge of the terrain but also of all possible sources of information. All too often a lack of language skills and of knowledge of the available archival material result in rehashing the same tired old story, or myths, again and again. Not in this case, Geert does not just use British, French and Russian sources, but above all material from those under-used Dutch military archives, as his seven page bibliography and 318 footnotes for about 150 pages of text proves. When I first saw this book, I was very surprised. It was not what I expected. Voorwaarts Bataven! is a hardcover, expensively bound book on high quality paper, printed by a publisher who specializes in expensive, presentation gift and coffee table-type books. It is lavishly illustrated with no fewer than 75 high quality prints and illustrations of all kinds, mostly contemporary plates and drawings. Of these, twelve are full-page illustrations, four of them in full color, and 57 are half-page illustrations, 17 of them in color, and there are five maps. Geert didn't forget the wargamers, either. No fewer than ten full orders of battles, down to company and battalion strength whenever the information was available, have been included. So what is the downside? The book has one obvious failing, the absence of decent situation maps. It does provide five historic maps, but they are presented as illustration material and are of no use at all for following the action. However the quality of the printing is so good, that after fiddling around with a photocopier, I managed to blow them up 500 % and still got a result that is perfectly readable. Secondly, where the illustrations are truly very nice, they were evidently chosen for a larger format book than the 24,5 by 17 format, that does not do them justice. Most of those prints are available in a beautiful atlas of the 1799 invasion by the same publisher for about 350 Dutch guilders (Wijnekus, V.J.M.L. and Lucassen, M.N.J. De Atlas van de Engels-Russische invasie in 1799. 32 unbound prints. Edition limited to 500 copies. ISBN# 90 288 1290 3.). And then of course, there is question of language. This book is written in Dutch. Those who have some German will find Dutch very easy to comprehend --it doesn't bother with that horrible German grammar and is much closer to English. However even English readers might consider buying this book. The illustrations are really superb and are probably unknown outside of the Dutch-speaking world. Any reader can, of course, understand the orders of battle. Possibly some will think this review rather uncritical. After reading it three times, I can still only say that I consider this to be an excellent book, both in content and presentation. © 1995 - 2019, The Napoleon Series, All Rights Reserved.